Obsessed with Scrapbooking: Check out the Upcoming Scrapbook Expos! Check out the Upcoming Scrapbook Expos! 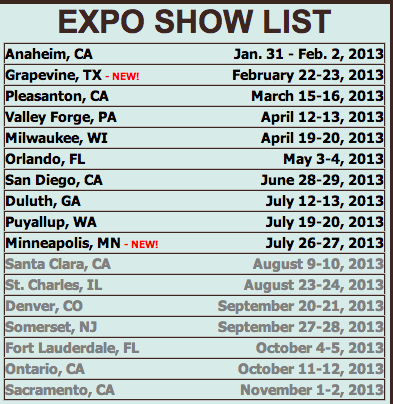 Scrapbook Expo is coming to Dallas/Grapevine this Friday and Saturday, February 22-23, 2013! I am going on Friday and taking two card classes. I love these conventions! You can still register for workshops, tickets, etc. through Wednesday for the Dallas Scrapbook Expo - check it out HERE. I hope to see some of you this Friday! Do you go to Scrapbook events? I love them! I would love to but they don't come to my area (MA/NH)! Waiting for the one in May here in Orlando, FL. Can't wait! Lots of fun! I'm already saving for the shopping frenzy! There are always some good deals, especially if you wait till the last few hours of the last day! Most retailers put items at half price or better, but the choices are not as good. I try to always attend the Expo in Puyallup, WA each year. They are always so fun. I have never been to one,but would love to maybe some day!Thanks for the video,I'm down loading it how! I would love it if they would come up to Maine! The only one that comes to NH is CKC. Anyway you can put in a word with these Scrapbook Conventions to come to MA,NH and ME? I'll be at Scrapbook Expo in Grapevine this week - so excited it is finally coming to Texas. I'm taking an alcohol marker class - need to figure out how to use them better. Thanks for the video. My sister and I will be there Friday...we are taking two classes, too!! Oh I hope that I see you there, Joy? I'll be there at the early bird opening so you may find me in a corner taking a nap about mid day!�� I'll make a small bed with my purchases, lol! But I'm really excited that it's here this year and I can't wait to check it out. I'm not taking any classes this time but there were some good ones available. And I also see that ScootinGranny (previous comment) my Cricut Circle sister will be there too so I hope that I'll have a chance to see you both! Have fun, Joy! Lin, Debbie, Angie and Scooting Granny - I hope I see you there! I am really excited about going! Also hoping they have some cool things to buy - love new scrappy stuff! MaMichelle, PKorner and Nancy - You guys are all in the same area (approximately) - maybe if you all contacted them, they would look into it. I'm sorry the northeast gets left out....HUGS! It was great to get to take a class with you at Scrapbook Expo. I really enjoyed the folded cards and getting a free stamp set of our choice (up to $19.99 value) from The Rubber Cafe as a part of the class was a super treat. This is the one I got http://therubbercafe.com/through-a-window.html . Looking forward to seeing you again sometime in the future! !